A brochure about Westinghouse Electric's combustion turbine systems. In 1980, Westinghouse's Combustion Turbine Systems Division (CTSD) embarked on a major advertising campaign to introduce its newly upgraded main product: the 100MW W501D5 gas turbine. This brochure was part of the marketing communications that was launched program at that time. Originally called the Westinghouse Electric Company, George Westinghouse (1846-1914) founded his manufacturing company in Pittsburgh, Pennsylvania, on January 8, 1886. In 1889, he renamed his business the Westinghouse Electric and Manufacturing Company. Westinghouse's primary products include turbines, generators, motors and switchgear related to the generation, transmission, and use of electricity. The company changed its name to Westinghouse Electric Corporation in 1945. 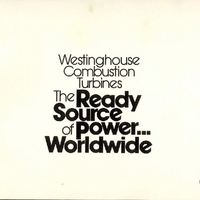 Original 32-page brochure: Westinghouse Combustion Turbines: The Ready Source of Power...Worldwide (Concordville, PA: Westinghouse Combustion Turbine Systems Division): Private Collection of Harry Jaeger. Digital reproduction of original 32-page brochure: Westinghouse Combustion Turbines: The Ready Source of Power...Worldwide (Concordville, PA: Westinghouse Combustion Turbine Systems Division). Copyright to this resource is held by Westinghouse Electric Corporation and is provided here by RICHES of Central Florida for educational purposes only. Scalzo, A. J., R. L. Bannister, M. DeCorso, and G. S. Howard. "Westinghouse W-501D 100 MW Single Shaft Heavy Duty Combustion Turbine." International Power Generation, October 1980. “Westinghouse Combustion Turbines: The Ready Source of Power...Worldwide.” RICHES of Central Florida accessed April 23, 2019, https://richesmi.cah.ucf.edu/omeka/items/show/6592.